die, my inelegant darling, die! Origins Award-winning game designer Dave Chalker calls these “Hand Slap” rules, because he has to slap someone’s hand every time they forget that rule and reach for the board in error. I have a game with a Hand Slap rule. When you play a card in LXIX: THE YEAR OF FOUR EMPERORS, the first thing must you do is advance the date on the calendar track, then you choose and execute an action. You earn a bonus action if you hit certain spaces on the calendar track. The bonus spaces on the calendar track add an additional decision point on your turn: do you play card A for it’s effect or card B for a possibly-lesser effect, but hit a bonus action space? It I feel it’s an interesting, if not entirely integral, piece of the game. Everybody forgets to move the calendar. I love LXIX. It’s one of my best designs. I’ve been steadily refining it for the last year and it really sings now, except for that darn, hand-slappy calendar move rule. Argh! Why is that rule so frustratingly hard for people to remember? Why can’t I just give it up? I don’t know. Sure, yeah, it’s my darling so I’m supposed to kill it, but why can’t my play testers just get it right? Obviously, this is a source of frustration for me. I should just get rid of the damn rule and try something different, but I’d rather people just paid better attention when playing. Then again, there’s already plenty to pay attention to in LXIX, and this one little rule probably wouldn’t be missed by anyone but me. But it’s my darling, how can I possibly kill it? LXIX: The Year of Four Emperors has roots in CRIBBAGE. It was born as a four-player iteration of a system I designed for a two player game that borrows and adapts some of the mechanisms of Cribbage. In the conversion from two to four players, some of the cribbage mechanisms were dropped to compensate for other added complexities. The last vestiges of Cribbage in LXIX are the crib, in the form of hidden scoring regions, and the count, in the form of the calendar track. I hate to lose these last, tenuous connections to the game that inspired it. I have an idea or two about how to fix this problem. The calendar track is just too easy for people to forget to use. The calendar probably has to go, but I’d love to keep the bonus actions in there somehow, because I think it’s an interesting decision point and it feels good when you get one. They can also be a big help for someone who drafted a less than ideal hand. In Cribbage, you score points if you match your opponent’s played card during the counting. Perhaps you can get a bonus action if you match your opponent’s card in LXIX? There’s no calendar track to remember and you only have to pay attention to the last card played. More importantly, If you forget it, it doesn’t affect the other players turns. Another option is to remove the bonus actions entirely. I’m not as big a fan of this idea, but it has some benefits. For one, it would allow simultaneous card play. If you don’t have to pay attention to your opponents’ card values, you don’t need a strict turn order. The order of resolution becomes more important, leading to a simplification and strengthening of another mechanism in the game: the combined turn order and tie breaker mechanism. 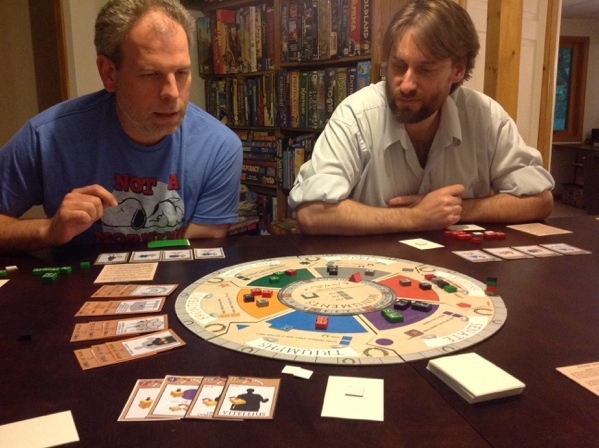 The next step is to play test–ideally several games in succession with the same group–to assess the impact of these various changes. Any volunteers? A) use the score track instead of the calendar. Perhaps scoring three points and getting a bonus is better then scoring 4 points. B) Give everyone their own personal calendar on their player-board. It’s also a good place to the turn sequence and what not. Also make the bonuses more interesting so that players really strive to achieve them. Perhaps every spot should be some kind of bonus, with a mix of weak and strong ones. Making bonuses more interesting/varied/specific has been suggested. Right now, there are three spaces out of thirty that will grant a bonus action, and you get your choice of four standard actions (basically, it’s like playing a second card on your turn). It has been suggested that I could add more spaces for bonuses, but each bonus space has a correlated action. e.g., from the 1 space, you might play a 4 card to reach the 5 space and get “bonus action: move one influence token,” or you could play a 9 card to reach the 10 space and get “bonus action: add 1 influence token.” That has the potential to induce analysis paralysis, as the decision tree multiplies. I had a similar problem with Doomed Atlantis. Each area tile describes what to place in it when it’s revealed, but you’re also supposed to draw a Discovery card to find out what else is there. This adds more variety to the board by differentiating the area’s base state from the state for the current game, and works pretty well. But people (including myself!) kept forgetting to draw the Discovery cards. The fix was pretty simple: I added “Discovery Card” to the instructions for each area tile. Heh, the first thing on each card is “Advance the Calendar” albeit in language-neutral iconography. I actually like Carl’s suggestion of adding something on the card that explicitly states to move the calendar. Do I remember right that there was an icon for that at some point next to the number? I think I like the calendar better than the match for getting bonus actions, or maybe a combination of the two? No matter how much I forget to move the calendar, I’m probably less likely to remember which card the previous player played. Since the card gets played and there is a delay while the player places his pieces, I feel like it will probably be forgotten as often as the calendar, or lead to a lot of “What number did you play?” There is some interesting strategy to which card you play, based on where the calendar marker is. I might have a 2 and a 3, and both might have the same action on them, but I decide to play the 2 because it puts the calendar 2 spaces away from the bonus. The next player needs to play a 2 if he wants the bonus. If I played the 3, he can play his 11 and get the bonus, plus place his leader. If you were looking for other ways to get the bonus, it might also be interesting to offer a bonus for playing the same color as the previous player. Now you have to make the choice about whether you want to play in an already packed region, but get a bonus, or play somewhere else, at the risk of the next player playing the same color for a bonus. Yes, that’s correct. In fact, I recently updated the icon and card layout to make it more obvious. I always have players play their cards out in an overlapping tableau, so you can always see a players last played card. But I agree, I really like the calendar play, which is why it’s so hard for me to give it up. Color matching is interesting, though it might make it too easy/tempting to load up an area, if you can double up placement with matching bonuses. I’d like to get a few guys together and run through two or three games in a row, testing the different methods.